Cosmetology offers a wide range of career opportunities for the self motivated, hard working, student. The increased emphasis on health and beauty in modern culture has made cosmetology a growing industry, and more and more students are headed to school for the training they need to take their place among the ranks of qualified hairstylists, makeup artists, estheticians, barbers and beauticians. A vast number of beauty schools have opened their doors across the country, inviting eager students to enroll in programs that offer paths to career independence and financial security. Many community colleges and vocational schools are also offering cosmetology programs for ambitious students. For years, beauty schools have been relegated to the lower rungs of the post-secondary education ladder. But that’s merely the ingrained snobbery of four year university graduates who like to think of vocational training as something less than a proper education. As any graduate of a cosmetology program knows, the training is comprehensive, time consuming, and quite rigorous. It takes a great deal of study to become a licensed cosmetologist, and that education doesn’t come cheap. Beauty schools and vocational colleges may offer a fast track into the national workforce, but the tuition can still be a barrier for many students. A variety of grants and scholarships are available for students pursuing careers in cosmetology, but even these can leave students with a financial shortfall. Student loans offer a way for cosmetology students to bridge any gaps in their education fund. The only question is, “Where to find them?”. Student loans for cosmetology schools are not as widely available as the more traditional education loan. That isn’t to say that they do not exist, but students will have to work a little harder to find them. The traditional sources of college loans will yield varying results. The majority of federal and state loan programs tend to address the needs of four year university students. Private lender loans will offer greater possibilities, but even here they may be limited and difficult to secure. There is, however, a sea change occurring in the U. S. education system, and a greater emphasis is now being placed on vocational training. This has led to an increase in the availability of continuing education loans, and these may offer valuable assistance to students pursuing a career in cosmetology. A point should be made about cosmetology schools and financial aid. Not all beauty schools are accredited institutions. The accreditation of a school, or lack of it, will have a dramatic impact on the availability of financial aid programs for its enrolled students. Many student loan programs are only available to students who are enrolled at an accredited college or vocational school. Independently operated cosmetology schools are very popular around the country, but many have not earned accreditation. For more information on accredited cosmetology schools, students can consult the National Accrediting Commission of Career Arts and Sciences. If you wish to pursue a career in cosmetology, but will need financial assistance to do so, you may want to limit your choice of schools to those that have received accreditation. Federal college loans are generally thought of in terms of four year universities. But with the renewed emphasis on career training, and on reducing the unemployment rate, Federal student loans are increasingly being made available to students enrolled in vocational programs designed to fast track them into stable employment. Consequently, the Federal Direct Student Loan program has been expanded to include students who are enrolled in an accredited community college, trade, career or technical school. This is one of the instances where attending an accredited cosmetology school, or enrolling in an accredited community college or vocational school, really makes all the difference. Cosmetology students will find the that following Federal Direct Loans may offer the financial assistance they need to pursue their career ambitions. Students considering Federal loans should understand that to be eligible they must be enrolled in an accredited school, and must be working toward an approved degree or certificate of completion. As with all Federal student loans, borrowing limits are determined by the applicant’s school of attendance and may not exceed the total cost of tuition. The Federal Direct Subsidized Loan is available to students enrolled at an approved community college, technical college, or trade school. To be eligible, students must be enrolled at least half time in an approved program leading to a degree or certificate. Federal Direct Subsidized Loans offer low fixed interest rates, payment deferments, and a six month grace period following graduation. Students who qualify for a subsidized loan will have their interest paid by the government for as long as they are enrolled in school. Direct Subsidized Loans are only available to students who can demonstrate the requisite level of financial need. The Federal Direct Unsubsidized Loan is similar to the Subsidized Loan in that it is available to students enrolled at least half time in an approved program leading to a degree or certificate. Unsubsidized loans also offer low fixed interest rates, payment deferments and grace periods. However, students who receive an Unsubsidized Loan from the government will be responsible for all accruing, and capitalized, interest, regardless of whether or not they take advantage of the payment deferment options. Students applying for any Federal financial aid must first fill out and submit their Free Application for Federal Student Aid, or FAFSA. The FAFSA is used to determine the level of government financial aid for which the student is eligible. Students should also take note that many schools and private lending institutions also rely on the FAFSA to determine loan eligibility. Whether enrolling in a four year college or a beauty school, students should make the FAFSA a priority. While government loans for cosmetology students are in short supply, private lender loans do offer a viable option for students in need of financial assistance. Private lender student loans differ significantly from their Federal counterparts. Private student loans typically have higher interest rates, more rigid repayment plans, and severe penalties for late payments or defaults. They are also more difficult to secure than government loans, and are decided solely on the applicant’s credit score. This can present a problem for many students, who are likely to have a limited, or non-existent, credit history. Many banks and private lenders do, however, allow students to engage a co-signer with a solid credit history in order to secure a loan. Cosmetology students who are considering a private loan may find it necessary to contact a number of banks and lending agencies to find a program that suits their needs. Not all banks and lending institutions offer continuing education loans, and students may find that they will need to do some research to find a suitable lender. The following lenders offer continuing education loans, and should demonstrate the types of programs that may be available to students pursuing a career in cosmetology. Sallie Mae is one of the leading lending institutions specializing in student loans. In addition to the more traditional college loan programs, Sallie Mae offers the Career Training Smart Option Student Loan. This loan offers competitive interest rates, flexible repayment options, and rewards for timely repayment. Students may borrow up to 100% of their school costs, less any financial aid already received. The minimum loan amount is $1000. The Bank of North Dakota offers the Dakota Education Alternative Loan for students enrolled in a continuing education program at an approved school or community college. The loan is only available to students attending schools in the following states: North Dakota, South Dakota, Minnesota, Wyoming, Montana and Nebraska. Loans are decided according to the applicant’s credit history, and students may borrow up to the total amount of their school costs. Wells Fargo offers their Student Loan for Career and Community Colleges. This loan is available to students enrolled in a two year community college, career or vocational school. Loans are decided on the basis of credit history, and offer competitive interest rates and flexible repayment options. There is no minimum borrowing limit, no origination fees and no penalties for early repayment. Never sign a loan agreement until you are sure you understand all of your responsibilities as a borrower. A career in cosmetology offers a wide range of employment possibilities. Licensed graduates of beauty school may begin their careers working in hair salons, beauty shops or spas. 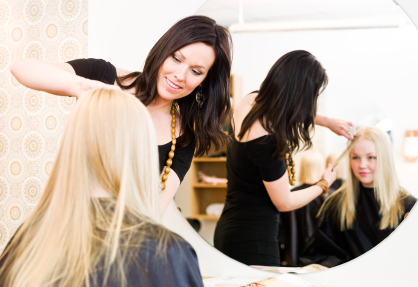 Many beauty school graduates ultimately open their own salons, and set forth on an entrepreneurial path. Other talented beauty school graduates will find themselves working in the entertainment industry, working as makeup artists and beauty consultants in television and film. Cosmetology is a highly competitive, and highly rewarding, field. With the right education, and a dedication to hard work, cosmetology offers endless opportunities.